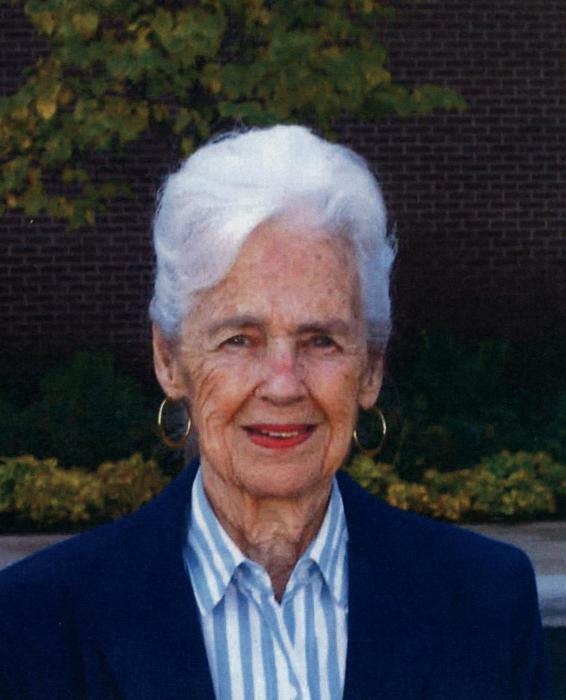 Obituary for Rosemary (Spellerberg) Harsha | Wellman Funeral Homes, Inc.
Rosemary Harsha, 95, of Circleville passed away on March 29, 2019. She was born September 7, 1923 in Upper Sandusky, Ohio the only daughter of Martha (Von Blon) and Leo John Spellerberg. She had four brothers: John Philip, David Leo, Herman Robert, and Thomas Richard Spellerberg all of whom preceded her in death. Graduating from Upper Sandusky High School in 1941 she attended Miami University and Ohio State University. She graduated from Dyke School of Commerce. She was employed by the Pratt Publishing Company’s National Petroleum Magazine in Cleveland. On September 28, 1946 she was united in marriage to William H. Harsh Jr., son of Imogene (Mathews) and W. Howard Harsha of Portsmouth, Ohio in the Reformed Church in Upper Sandusky. After Bill graduated from Western Reserve University Law School in Cleveland the couple settled in Portsmouth where Bill began practicing law with the law firm of Miller, Searle and Fitch, and later with Kimble, Kimble and Schapiro. He later served as Scioto County Prosecuting Attorney. They were parents of four sons: Judge William H. Harsha III (Shelly) of Circleville, Dr. Mark Mitchell (Daneen) Harsha of Grand Junction, Colorado, Dr. Bruce Buchanan (Nancy) Harsha of Tucson Arizona and Dr. Brian Christopher (Katharine) Harsha of Myrtle Beach, South Carolina. The first 15 years of marriage were spent in Portsmouth. In 1960 Bill was elected to the U.S. House of Representatives, Washington, D.C. where he served in congress for 20 years. The family moved to McLean, Virginia and lived there for 25 years until Bill retired and moved to Portsmouth in January 1987. Rosemary Harsha was a member of Chi Omega Sorority, a member of the Congressional Wives Club. The Ohio Congressional Wives Club, member of the Ladies Golf Association at the Congressional Country Club in Bethesda, Maryland. In Portsmouth she was a member of the Ladies Golf Association at the Elks Country Club. A member of Second Presbyterian Church she served a term as Deacon. She enjoyed doing her own work of all kinds and in walking for exercise and pleasure. She is survived by her four sons and their wives and six grandchildren: Blair Harsha, Amy Harsha, Amari Harsha, Mark Mitchell Harsha Jr., Christen Harsha and Brian Christopher Harsha Jr., three great grandchildren Braden, Bryce and Scarlett, nephews James Jr. and Jeff Harsha, two sisters-in-law Elinor Spellerberg of Tiffin and Shirley Spellerberg of Corinth Texas, nieces Barbara Spellerberg Jappimen, Marty Spellerberg Green, Jane Spellerberg Stroman, Nancy Spellerberg Britenburg and Janet Spellerberg Bersley, nephews David Spellerberg Jr., Scott Spellerberg, Jeffery Spellerberg, Lance Spellerberg, Craig Spellerberg and Grant Spellerberg. Private graveside services were held in Portsmouth. In lieu of flowers memorial contributions are suggested to your local Hospice. Wellman Funeral Home is handling the arrangements. Online condolences can be made to www.wellmanfuneralhomes.com.